I think it’s safe to say, moving is stressful for anyone. For those without mental health issues, it is stressful. Add something, like anxiety, into the mix and a large life event such as moving gets even harder to manage. Let me clarify what I mean by anxiety. Everyone has moments of anxiety, and just because you may have some doesn’t mean you have a diagnosable mental illness. There are many forms of anxiety that can be diagnosable, but in this blog I’m going to talk about generalized anxiety. This is the type of anxiety that one feels constantly, for various reasons, or for no reason at all. The kind of anxiety that turns molehills into mountains. The kind of anxiety that makes it very difficult to do ANYTHING. It’s going to take too long. Why even bother? Look how much there is to do. It will never get done. Anxiety doesn’t just mess with my thoughts, but it also makes me FEEL just how overwhelming something is. This anxious overwhelmed feeling, for me, typically starts in my chest. It feels like a thousand butterflies trapped, desperately beating their wings trying to escape as my lungs tighten in around them. It progresses from there into a panic attack unless I am able to stop it with coping skills or medicine, depending on the severity. This anxiety reinforces the dangers (made up or otherwise) that my mind believes. As is often my case, “danger” is signaled by feeling stressed and overwhelmed. 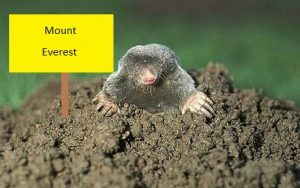 So How Do I Not Turn a Molehill Into a Mountain? I don’t know about you, but I certainly can’t keep everything in my head. Anxiety tends to make my mind race, so it is nearly impossible for me to keep my to-do list straight unless it is written out. Lists are essential! It helps to see on paper (or electronically, whichever you prefer) what needs doing. And I find a sense of accomplishment in being able to check items off. Sometimes I throw a few items in there JUST for checking off. No one said you can’t have fun with it, so “Make a list” totally counts as a “to do” and can then be checked off right away! Ahhhhhhhhhh – look how I already accomplished something! Sometimes all of the things that have to get done feel overwhelming because in my head it seems like they all have to be done NOW. However, anxiety is not very truthful. Not everything has to get done RIGHT THIS SECOND. Writing out a list can help prioritize what has to be done now, tomorrow, next week, next month, etc. When my “to do” list starts to feel overwhelming, breaking items down into smaller pieces helps. Let’s face it, if I wrote down “pack my apartment”…that feels extremely overwhelming because there is A LOT that goes into such a task. So when you have a big task to complete, how can you break it down into smaller bites? Into something more manageable? How can you turn your mountain of a task into a bunch of molehills? In my case, I started months ago with the task of “obtain packing supplies”. After that, my to-do list has focused each weekend on smaller tasks that will make this upcoming week (the major packing and move week) less stressful. I’ve packed what I can, devised a plan and enlisted help to move my critters, and purged items that I no longer need. In the next week, I’ve assigned each room to a “day” and belongings in that room (except what I need for the week) will be packed on that day. So I’m not going to be doing EVERYTHING at once. Also note how I started this process months ago. Knowing yourself is essential. If you are better at spontaneity, then great! If you’re the type where planning and taking your time helps lessen anxiety, then do that! What else can you do during these types of overwhelming tasks or life transitions to help with anxiety? One thing that I’m a big fan of is know what you are capable of. Recognize when you’ve hit your limit. TAKE CARE OF YOURSELF. Take breaks, reward yourself (however you self care), and when you are done with your tasks…BE DONE! If anxiety is telling you “do more because otherwise it won’t get done” then look back at your to do list and remind yourself how you have planned everything out. There will ALWAYS be stuff to do. We never take enough time to just BE. (That’s a subject for another blog!) And in the end, it WILL all get done one way or another. Also, if you need help…ask! If you have supportive people in your life it can be helpful to talk things out with them and get an objective idea on how to sort it all out. In addition, be aware of your own “self talk”. Too much negative self-talk is NOT going to help you and can increase anxiety. For some people, positive self-talk can be helpful. Personally, I’m a fan of mixing positive self-talk with realistic self-talk. Constantly telling yourself “I can do this!” is great…because you can!!!! However, you may be having a day where you can’t tackle everything on your to-do list. And guess what…THAT’S OK! There’s always tomorrow. Sometimes it’s not realistic for me to get everything done on my to-do lists every single day. Things I hadn’t anticipated come up. Tasks take longer than expected. Health issues impede my ability to complete what needs doing. In these cases, my “to do” list items get bumped to other days. Does that mean I failed (as sometimes my mind tells me?) Absolutely not! It means I’m HEALTHY because I know my limits. So tomorrow my to-do list includes taking care of all my animals, cleaning out my car, and purging some more items. I will be sure to carve out time to relax and enjoy my weekend because without some balance, I will feel much more anxious at the end of the day. If you feel you need some help in dealing with a large life transition, or you are dealing with anxiety and could use some coping skills to make life easier, feel free to contact us at LifeCare Wellness. We have many therapists who are trained in helping clients with anxiety reduction, including specific interventions such as EMDR. Give us a call today!